While this video is from March 2012 it is still relevant. The plight of Black Libyans has not gotten any better since the recent national elections. So before the interventionists pat themselves on the back for bringing “democracy” to Libya, perhaps they should watch this video. Piggybacking on my last post regarding the conflicting reports out of Syria, Turkish Newspaper Today’s Zaman, reported today that the recent downing of a Turkish fighter jet was not caused by Syria. Officials in Turkey are disregarding the militaries investigation. They are still holding onto the notion that the jet was shot down by Syria in international waters. All despite the fact that no missiles were detected by the radar system on board the Turkish jet or Turkish land radar systems. It’s worth noting that American officials did not completely believe the Turkish explanation for what happened to the jet. Yet America is willing to believe any Syrian activist who says something negative about the Assad regime. Shadi Hamid, the Director of Reashearch at Brooking Doha Center Center, has become a cheerleader for Western intervention. 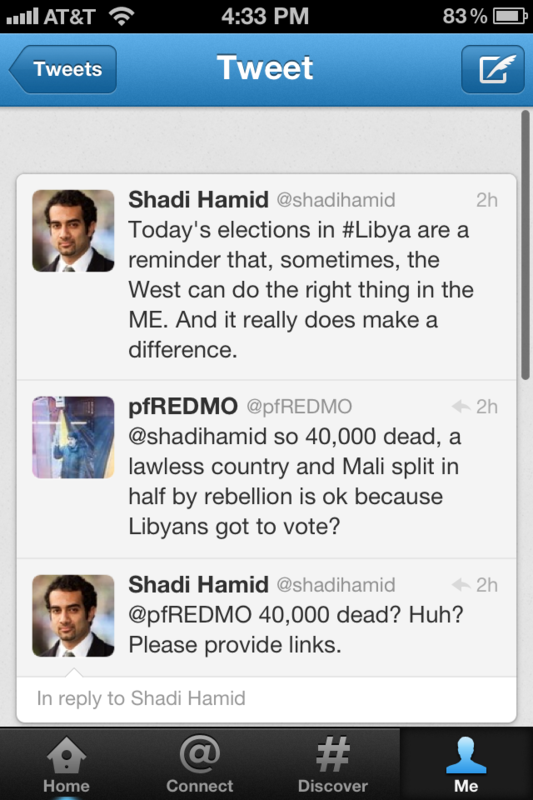 If you follow Middle Eastern politics at all than you will be very familiar with Shadi Hamid. 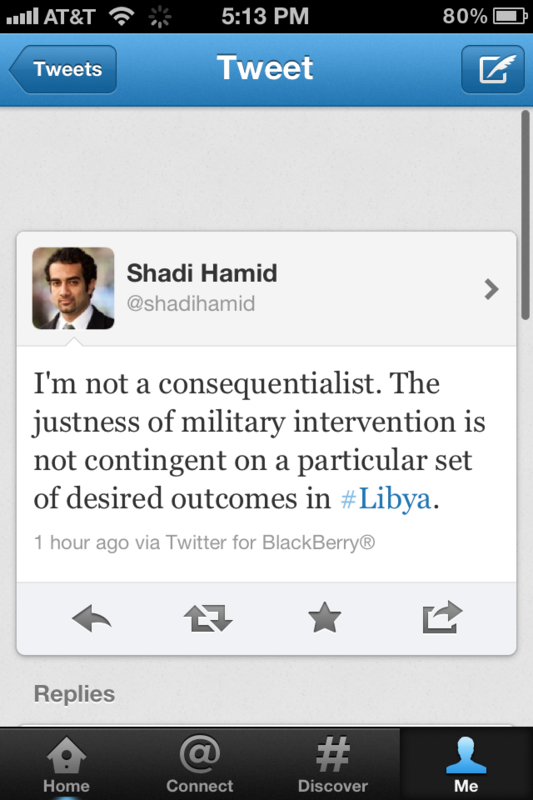 Latley Hamid has become a cheerleader for Western intervention in the Middle East. He pushed hard for the West to get involved in Libya, and has been urging world powers to set up “safe zones” in Syria. It is very troubling that a man as smart as Hamid would be so cavalier about getting involved in another civil conflict in an Arab nation. 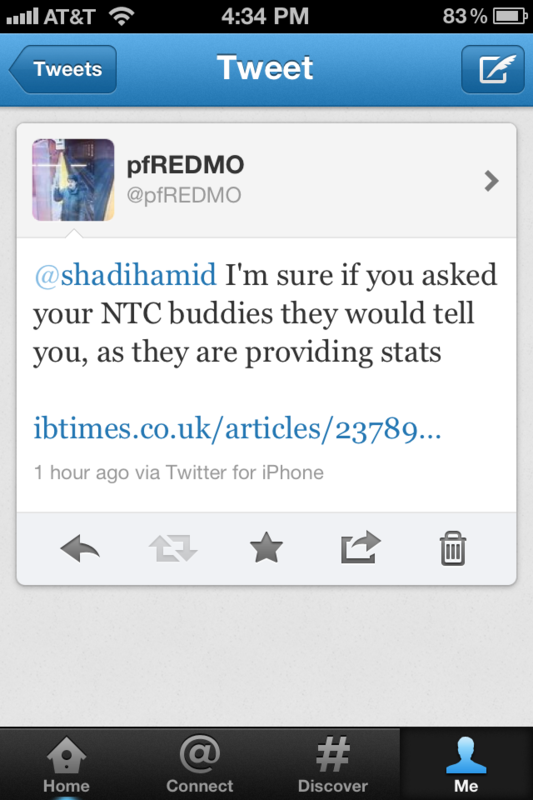 This morning me and him got into a little bit of a Twitter fight. By that idiotic reasoning, the American led war in Iraq was totally fine. They got to vote and dip their index fingers in purple ink. 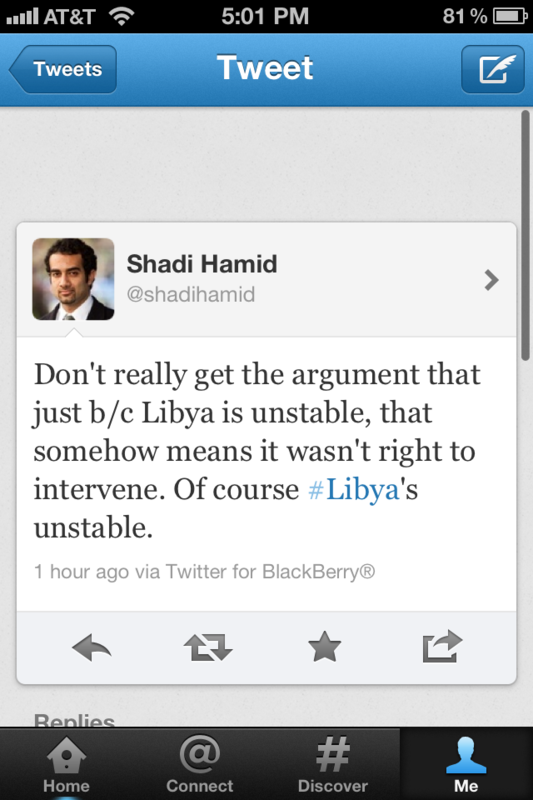 Who cares that its unstable and violent and as repressive now as it was under Saddam. Perhaps we should intervene in every Arab country. As long as they get to vote does it really matter what the consequences are. 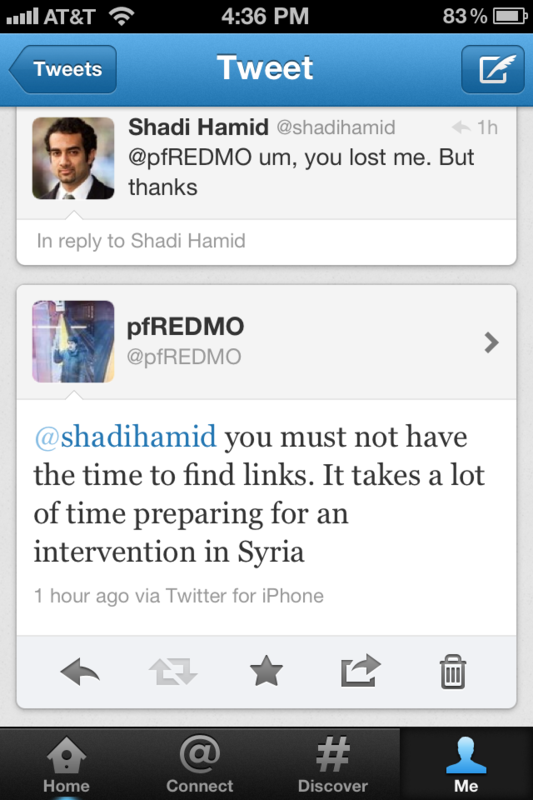 Shadi Hamid later re-tweeted warmonger John McCain talking about shwarma. 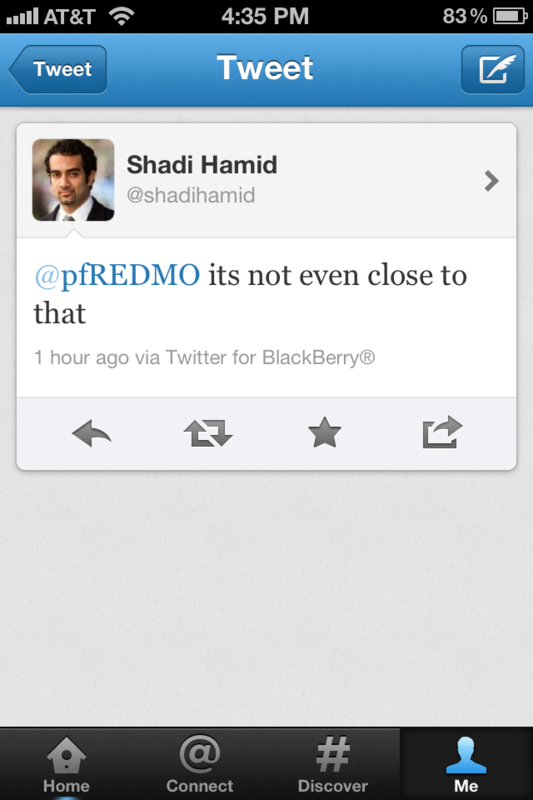 That about sums up how repulsive Shadi Hamid is.